Chandrayaan 1 was India's first unmanned lunar probe launched by the Indian Space Research Organisation in Satish Dhawan Space Centre, Sri harikota, Andhra Pradesh, India. Main objective of the mission is to Increase scientific knowledge about Moon and also to know chemical and mineral mapping of entire lunar surface. The major chemical element researches are about magnesium, aluminum, silicon, calcium, iron, titanium, radon, uranium and thorium. Searching in lunar surface for lunar water ice, especially at both lunar poles. Former Prime Minister Atal Bihari Vajpayee was announced about the mission in August 15 Independence speech in 2003. In 2008, November the vehicle was successfully inserted in to lunar orbit. 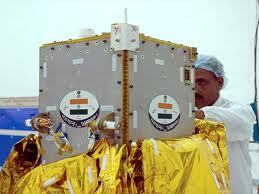 In 14th November 2008, the Moon Impact Probe separated from Chandrayaan orbiter and landed as expected. India is the 4th country to place flag on the Moon. The probe will take sample of underground soil in the moon and that could be analysis for the presence of water in the moon. The estimated cost for this project is 3.86 billion Indian rupees. The remote sensing lunar satellite is 675 kilograms in lunar orbit and it carries high resolution equipments for visible and also soft-hard X-ray frequencies. It surveys the lunar surface and takes a complete map of its chemical characteristics and also three-dimensional topography. In 29th August 2009, Chandrayaan stoped sending signals due to various technical issues and also failure of the star sensor and thermal shields in the probe. ISRO officially announced the mission is over but Chandrayaan achieved 95% of its planned objectives and also discover the presence of water molecules in the lunar soil. The Images of lunar surface was first transmitted to Indian Deep Space Network at Byalalu Near Bangalore, then it was flashed to Telemetry Tracking and Command Network (ISTRAC) at Bangalore. Chandrayaan craft completed 3000 orbits acquiring 70000 images of the lunar surface is quite record when compared to other nation lunar flights. Chandrayaan’s cameras daily sent near 535 images of lunar surface.